The pleasure of viewing Niagara Falls plein air paint out paintings is increased by the memory of the events, people and location on each day. It was a pleasure to work next to so many excellent artists; our quickdraw event was an experience in artistic cameraderie- the sun, the rain, the clouds that effected each of our images in progress. I will always remember the 'sound of the sun' as it emerged from the rainclouds-a burst of artistic exclamation. Thanks to everyone for sharing tips and techniques, compliments and ideas, and thank you Jacq, Charlie and family for your hard work. I look forward to seeing you all next year. shelter in the drizzle. As the sun coyly hid and reappeared, some cheered,others booed, for their light was lost! Great fun and camaraderie. At the lovely reception and awards on Saturday evening at Edgewater we were fortunate that John Stuart Pryce brought along his fabulous sketchbook from his Arctic Quest foray, full of gems. Thank you, Jacq and crew, for another amazing World Wide Paint Out. Niagara Falls Paint Out Fantastic! many wonderful pieces of art resulted from the two days of painting. imaginable nationality. Niagara Falls is truly a cosmopolitan place. really did an effective job of getting the word out about the event. including the twin cities. I definitely plan to come again. WHAT AN EVENT! THE DEDICATION OF OUR FOUNDER, JACQ, OF THIS ORGANIZATION IS AMAZING AND TO BE ADMIRED! THE ENTIRE EXPERIENCE.. . THE TIME SPENT DRIVING TO NIAGARA WITH MY FRIEND AND FELLOW ARTIST LAURA BIANCO, SEEING AND PAINTING THE BREATHTAKING FALLS, GETTING TO KNOW JACQ AND CHARLIE, THE VOLUNTEERS, ENJOYING THE BEAUTY OF THE CITY- WHAT GARDENS!! !, SEEING FRIENDS FROM THE HUDSON VALLEY AND THE NEW RELATIONSHIPS ESTABLISHED WITH SO MANY AMAZING TALENTED ARTISTS HAS GIVEN ME ADDED CONFIDENCE AND HAPPINESS. GETTING AN AWARD WAS SWEET ICING ON AN ALREADY VERY RICH CAKE. THE ENERGY OF THE WHOLE EXPERIENCE WAS AWESOME. I LEFT NIAGARA WITH AN EVEN STRONGER COMMITTMENT TO MY MISSION OF USING MY PAINTINGS TO CAPTURE THE BRILLIANCE IN CREATION AND IN BRINGING LIGHT TO PEOPLES HEARTS. YES KARL, WASN'T IT FULFILLING THE WAY THAT PEOPLE FROM ALL NATIONALITIES SPOKE TO US, ASKED QUESTIONED AND EVEN TOOK THEIR PICTURES WITH US? NORMALLY I LIKE TO PAINT IN SOLITUDE BUT THAT WAS REWARDING. WE PLAY AN IMPORTANT ROLE. ART IS A CONNECTING FORCE. INDEED, ART KNOWS NO BOUNDARIES AND IS THE UNIVERSAL LANGUAGE AS WE ALL KNOW. IT IS AN HONOR AND PRIVILIGE TO BE A SIGNATURE MEMBER AND REGIONAL AMBASSADOR IN THE IPAP. JACQ, YOU ARE A GREAT ROLE MODEL FOR ALL THE ARTISTS. 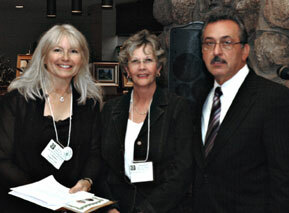 I WILL CONTINUE TO DO MY PART TO PROMOTE THE ARTISTS IN THE WORLD AND THE IPAP. CONGRATULATIONS TO ALL OF YOU WHO PARTICIPATED. HOPE TO SEE YOU ALL NEXT YEAR AND IN THE MEANTIME KEEP IN TOUCH WITH WHAT YOU ARE DOING! Hi all, another great Niagara paint-out. It was great to be there again and be re-aquainted with friends and meet new ones. Thanks for another great weekend Jaqu and Charlie, and Jaqu, your weather Halo is still intact. Let's all keep in touch, best regards, John. at the world the artists create on canvas. I had a chance to speak with many of the patrons of the restaurant who were admiring the artists creations.were admiring the artist's creations. "It's exciting to see the different interpretations of the subject"
One man asked me which paintings were mine. I was tempted to say ALL OF THEM. Click to apply to International Plein Air Painters - Application and Membership fee required. Thank you very much for another great weekend of painting at Niagara. weekend. Thank you to Charlie for ferrying us down to the Maid of the Mist on Saturday, even though he had to rush off for a wedding. It was much appreciated. 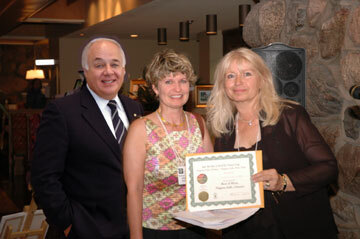 I am honoured to have won the Purchase Award prize from Niagara Falls NY. It is a nice connection you are making with the participation of the two cities... (or "one city with a river dividing it", as Mayor Anello said on Saturday night). It was a pleasure to meet so many interesting and fun people in the group. We really enjoyed having the opportunity to get together on the Friday night as well. I am looking forward to receiving the CD record of the weekend. Dear Jac, I wanted to drop you a note to say thank you for all your efforts in arranging a wonderful paintout at Niagara Falls. You made the event fun and interesting! I had a fabulous time painting a variety of inspirational scenes and absorbing the exciting energy of your city and it's wonderful people! The only downside was not having enough time to paint all the breathtaking scenery! Please extend my thanks to everyone involved in the event. Not only was I made to feel welcome, I was made to feel at home and I really appreciate that. Please feel free to use this email in whole or in part as a testimonial for the website. Thanks for another enjoyable Paint Out. It was good to see former participants and meet new artists this year. 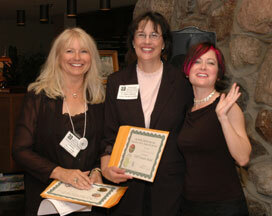 It's great to see the plein air fellowship growing. The artist's work looked better this year and the enthusiasm around the event was very obvious. The Quick Draw was also fun and challenging event this year. The other bonus was seeing you Jacquie and your group the day after the event at The School of Horticulture. Next time I get back to Niagara and am able, I'll give you a call Jacquie and we'll get out painting. Attached is one piece I didn't get to show you. Bruce and I had such a GREAT time! Thank you. 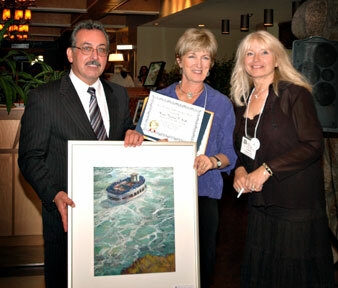 What a wonderful event the IPAP Niagara Falls event was this year! I thank you Jacqui for all your hard work to make it happen. The Wallkill River School participants really enjoyed their first professional paint out. I was glad tomake it the Niagara Falls event because it is a warm and welcoming environment, the same sense of well being we try to create in our workshops. Having organized many paint outs in Orange County, I understand the behind-the-scenes work you put into your events. I appreciate that, Jacq. You are a true role model and I am glad that I, and our workshop participants from the Wallkill River School, had the chance to paint and enjoy your corner of paradise. "One Great City with a river running through it." for paintings created all in one day. That collector will find a grand array of subjects,styles, cultures created at the same time from differing locations. The Niagara event was superb. 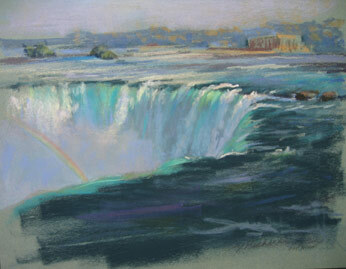 The falls are a never-ending source of inspiration and a bit daunting to paint - to do this natural wonder justice! But paint it we did. What fun we had. I hope you'll share your adventures wherever you were on one, two or three of those memorable days! I am also glad to see how many painters out there took a leadership role to organize events. And to you individual painter whose names we may never know, I hope you had fun participating too! It was my second Niagara paint-out and I want to say thanks again to you and the crew for organizing a wonderful event! The gorge, the mist, the gardens - we felt that there were so many locations with subjects to paint, it was hard to choose one. I noticed that the public seems to enjoy having us around, watching us work, asking questions & talking about their art experiences. They took pictures of me and I took pictures of them (with the Falls cascading in the background, of course). I met so many interesting artists with amazing vision & style - all of them so very inspiring...and as usual, I could not pick a favourite - the artwork was all so beautiful.